This entry was posted in Day Hiking Tips & Advice and tagged Blister, Clothing, Hiking, Hiking boot, outdoor, Recreation, Sock by bhengst. Bookmark the permalink. I always wear a thicker wool or wool blend and then a thin liner. I have not had any luck with the synthetics. Like boots each person has their own fit. I would suggest to any hiker wanting to try both to do so. It will only help them figure out what suits them best. It’s funny. I have had the exact opposite experience. I find wool socks to be hot, sweaty and itchy which is never a good combo on the trail. When worn with a liner they become bulky as well 😦 besides, aren’t most liners made from a synthetic blend? If that’s the case why not just start with a synthetic sock? Your welcome. 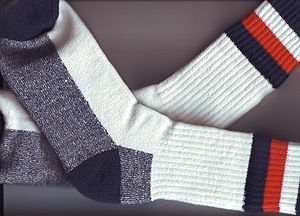 You are correct in saying that most sock liners are synthetic but I find that my feet are normally sweaty and by having the liner and the wool sock combo they tend to wick away the sweat into the wool allowing the liner to dry and the wool sock taking a little longer to dry while in the boot. This helps with less hot spots and my feet do not look like they came from a water filled trench when I get done. I’ve used Bridgedale socks and sock liners for 10 years and wouldn’t use anything else. Wicking and comfort! may also stock some conventional foods (usually dry produce), if they cannot find the organic version. of obscure wisdom dispensed via glass cruets or powder-sacks. The great gurus have always said to set goals to succeed. or lemon juice to five parts water. The final herbal detox tea on this list is called Hawthorn berry tea. wind blows in the winter, we can easily reach temperatures of -30 to -35 degrees Celsius). India, China, Java, the West Indies.